As 2016 gradually winds to an end, many Nigerian religious leaders have been churning out prophecies that are meant to be earth-shaking. 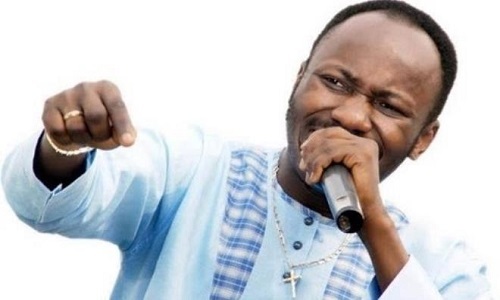 According to the President of Omega Fire Ministry, Apostle John Suleman, in his 50 prophecies for 2017, Aisha must be wary for her life. As reported by Daily Post and other online media, Suleman, in a statement issued by his Public Communications Advisor, Phrank Shaibu, said some ‘forces’ in Aso Rock were planning to poison Aisha and that the same ‘forces’ will alienate vice-president Yemi Osinbajo. The prophecy states that the “Aso Villa forces” will make attempts to remove Osinbajo from office, but they won’t succeed. The Apostle also said that “God will humble Buhari in 2017;” and that Mr. President will be bereaved in 2017. He did not elaborate, however. 2. Federal Government of Nigeria should not relax yet on Boko Haram. It’s a deception. 3. Buhari to face impeachment threats. 5. Crude Oil to flow in Northern Nigeria. 6. Abuja to experience major fire explosion. 7. Donald Trump to face impeachment attempt as members of congress are divided on his style of leadership. 9. Things will pick up a bit in Nigeria but hunger will persist. 11. Buhari will be bereaved in 2017. 12. Ecobank, Diamond, Fidelity, GTB to retrench staff. 13. President Buhari’s health needs attention. 14. 2017 budget will have crises. 15. More judges to be humiliated. 16. MMM to dupe more Nigerians and I see court cases. 17. Dollar to exchange for N615. 19. MTN and Glo to face hardship. 20. A former First Lady of Nigeria needs prayers over her health. 23. Nnamdi Kanu’s detention to cause international crises. God is angry with Buhari for the continued detention. 24. Donald Trump to favour Israel. American Embassy in Israel to be moved to Jerusalem. 26. Ghana’s new president to send many to jail. 27. Buhari and Senate to have crucial disagreement. 28. Nigeria’s Budget will be delayed. 29. I see killings in Ekiti. 30. EFCC to come after National Assembly members in Nigeria in a politically motivated arrests because of their refusal to confirm Magu. 31. I see kidnappers entering schools. 32. Nigeria will lose a great man of God and the New Year is when the Nigerian government will fight the Church like never before. 33. Some terrorists will be arrested in Lagos. 34. Traditional rulers indicted and arrested for corruption. 35. Lufthansa, Dana Air, Ghana Air, Aero Contractors… I see staff protests. 36. America to have financial crises. 37. A serving cabinet minister in Nigeria will die. 38. Nigeria to secure foreign funds. 39. Doctors will embark on strike in Nigeria. 40. A new mega party in Nigeria will swallow up APC. 41. I see a new leadership for the APC in Nigeria. 42. I see the DSS being taken to court. 43. France, Spain, Russia to pray against train going off the rail. 44. I saw a huge school building collapse. 45. Nollywood to pray. They will get help but will lose two major people. The Yoruba movie industry too; but prayer can avert it. 46. Fulani herdsmen again! Taraba, Benue, Imo and Jigawa states. 47. Kogi State to organise state prayers to avoid major deaths and natural disasters. 48. Edo State; major celebration but pray against road crashes. 49. I see presidents being removed in Africa, I see presidents being installed. 50. Two times, Nigeria’s vice president, Yemi Osinbajo, will face removal from office. They will alienate him and they will make attempts to remove him. But God will humble Buhari in 2017.